TAB Baldwin can now be called as the head coach of the Ateneo Blue Eagles, based on recent orders of the UAAP board. On Saturday, the coliseum barker announced Baldwin as the head coach of Ateneo during the pre-game introductions for the first time this season in the Blue Eagles’ match against University of the Philippines. In previous matches though, Sandy Arespacochaga was acknowledged before the game as coach with Baldwin as a consultant. A source said the ‘coaching change’ was made possible with an order by the UAAP board due to complaints being received from other schools. 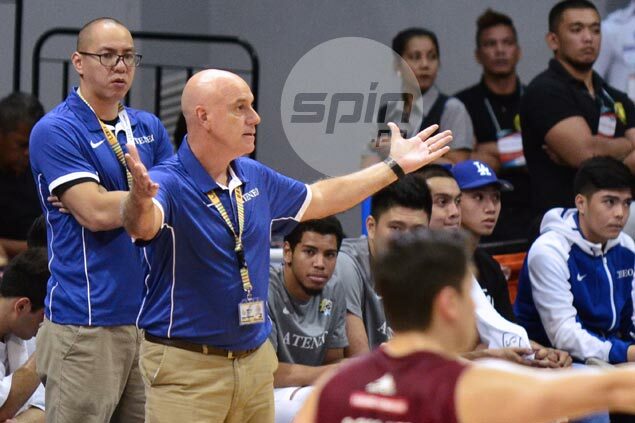 The source explained schools have spotted Baldwin calling out the plays in Ateneo games, but is exempted from technical fouls since the Gilas Pilipinas head coach is a consultant on paper. “Siya kasi ‘yung tumatawag ng play at para matawagan ng technical foul, kasi hindi covered ng technical foul ang mga consultants,” said the source, citing the scenario that two technical fouls called on Baldwin the consultant means Arespacochaga the coach gets thrown out. Ateneo’s move to name Baldwin as consultant was perceived as a means to avoid issues with the stance of the Basketball Coaches Association of the Philippines (BCAP) against foreign coaches in local shores.